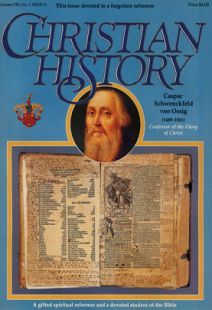 CASPAR SCHWENCKFELD was deeply concerned about the development of the personal Christian life; he believed that reformation without reformed lives was meaningless. He also believed that a Christian community, motivated by the direct indwelling of the living Christ, might become an effective agent for change in society. The focus of Schwenckfeld’s life and thought was on the personal experience of the living Christ. For him, God alone is the teacher; He touches the inner life of the seeker by granting experiential knowledge of Christ (what Schwenckfeld called, in German, Erkenntnis Christi). This teaching on experiential knowledge of Christ is the central concept of Schwenckfeld’s theology. It is defined by him in a variety of ways, but in no place does he give a precise definition of it. In general, the term he uses for this experience, Erkenutnis Christi, defines the maturing awareness on the part of a believer that he or she is empowered daily by Christ to live for God and others. In this process, maturity is not a static goal that can be achieved at some point in this life, but is a goal toward which the Christian constantly moves as the living Christ becomes more and more evident in his or her desires and actions. This goal is achieved only after death and resurrection, when the believer is glorified in heaven. As Christians in this life, as we gain personal knowledge of God’s creation, of sin, and of God’s activity in reaching for sinners, God makes us aware that we cannot achieve maturity on our own. Only the Spirit of God, permeating the believer, can give new awareness of God, ears to hear God’s Word, new eyes to see God’s activity in his creation, and a new desire to seek more knowledge of God’s will for his new creation. When this process is begun, the believer is “enrolled ” in the School of Christ, and is justified by God. (Metaphors from schooling are important in Schwenckfeldian thought about Christian growth; the experiences of being taught by God and of growing as Christians toward the perfect image of Christ are described as a schooling process.) God alone effects transformation in the natural person (i.e., the person outside of Christ). This spiritual birth affects all human relations. Through a life-long journey of faith in God, the pupil in the School of Christ gains an intimate awareness of the presence of the risen, glorified Christ. As one experiences this awareness, he or she feels Christ’s presence, accepts his power, and affirms his authority by doing his will. This spiritual experience of Christ develops by degrees, or stages, as one journeys through life, feeding on (i.e., learning from) Christ. Schwenckfeld developed small groups, or conventicles, to nurture believers. In these conventicles, spiritual fellowship was affirmed among the believers. This affirmation was expressed by participating in a nonjudgmental, supportive, “risk-taking ” endeavor to study the Scriptures, to pray together, and to seek the well-being of all for the glory of Christ. These conventicles were the social context for participation in Schwenckfeld’s School of Christ. It is obvious that Schwenckfeld placed emphasis on the individual relationship to God at the expense of the individual’s relationship to society. His prime objective was to show the need for a personal experience of Christ, or man’s deficiency when unaware of the living Christ. Although Schwenckfeld did not legislate the way in which the growing Christian should relate to society, his letters indicate his practical concern that the believer’s new being be visible in a renewed life style. Schwenckfeld taught that there are measurable marks of the experience of Christ in the lives of true believers. These are: a growing awareness of being accepted by God, a release from tension as a result of being freed from the need to justify oneself as one relies on the grace of God, an awareness that true spiritual struggle begins only after conversion and continues throughout life, and that one is enabled to endure the struggle with greater strength the more one participates in Christ, and in an active involvement in the life and concerns of the spiritual brotherhood. The experiential knowledge of Christ has been a guiding principle of the Schwenckfeldian tradition and has had a determining influence on its concept of education, even down to educational practices in the present-day Schwenckfelder Church. It is in this experience that the believer grows toward the fullness of the glorified Christ—true God and true man. This experience begins with the individual, then develops within the group, and finally is directed toward the broader community. Schwenckfeld was not an experiential educator, in the modern sense of the term, but Schwenckfelders have always placed a great deal of emphasis on education. Personal growth, an integral part of the experience of knowing Christ, involves growth in the knowledge of self, others, and the world in which we live. The learning experience, based upon knowledge of Christ, is theological in orientation. That is, in every stage, God is recognized as the true teacher, motivator, and as the one who empowers. As mentioned at the beginning, Schwenckfeld was very concerned with the practical outworkings of new life in Christ. He emphasized that awareness of self, of the world, and of God as the Creator is the beginning of the process which leads toward the realization of the new human potential available through grace. The non-Christian can become mature as a created and fallen person, but only the Christian can become mature as a created, fallen, and spiritually renewed person. Rev. Dr. Jack R. Rothenberger is senior minister of the Central Schwenkfelder Church, Worcester, PA.
Oliver Cromwell and the Effort to Save the Waldensians. During the Third Great Awakening of 1857 to 1859, 10,000 people in New York City alone gathered together daily—even left work—to pray. The same thing was taking place all over the country, in small towns as well as in great cities. Three great Bible truths were central to all of Moody’s preaching.